Too late to shop. What are you going to do? OK, there are only five days to Christmas. You waited too long to order anything, and you don't want to go the mall. And besides, you're sick of the whole corporate gift-giving thing anyway, right? Don't worry. 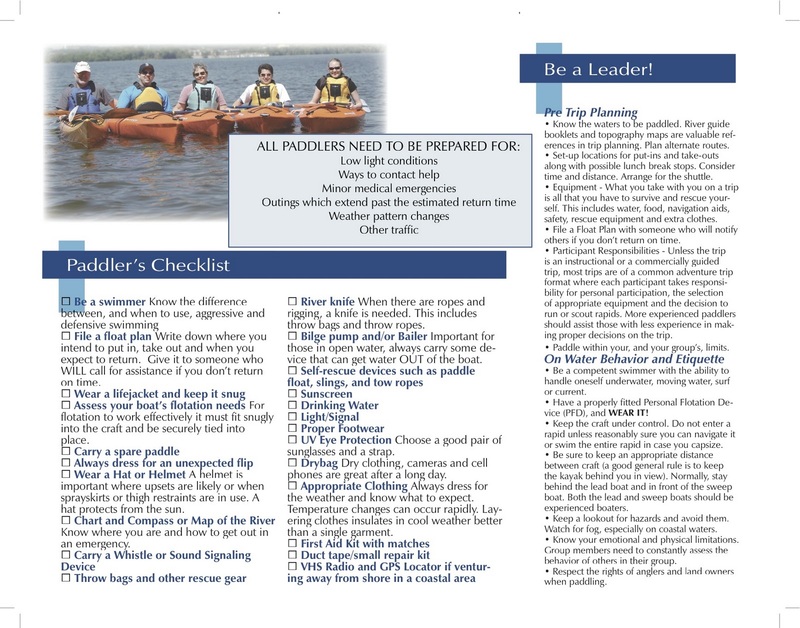 We've got you covered with many perfect gifts for the paddlers in your life. 1. 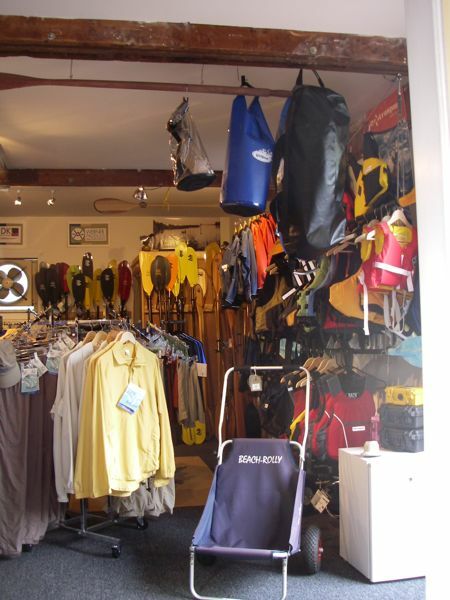 A gift certificate from your local paddle shop. If you don't have a local paddle shop, buy them a membership at OutdoorPlay, which will entitle them to 15% off and free shipping for life. 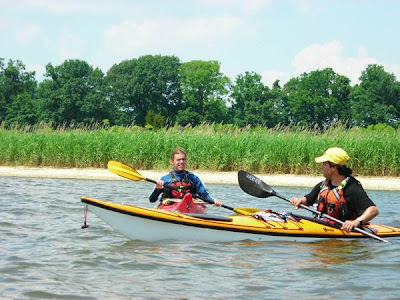 Couple it with a year-long membership to Paddling.net so they can sell their old gear. 2. Subscriptions to paddling publications. 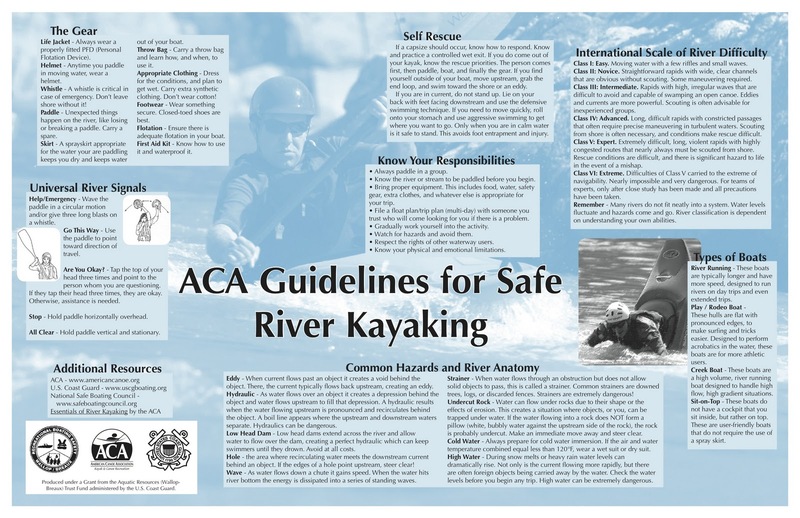 If your favorite paddlers are members of the American Canoe Association, they'll get their pick of Rapid Media publications (Adventure Kayak, Kayak Angler, Rapid and Canoeroots). 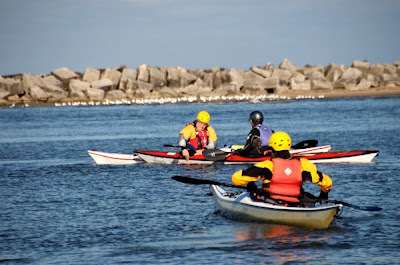 Other great sea kayaking publications include Sea Kayaker, Ocean Paddler, and Canoe & Kayak. 3. 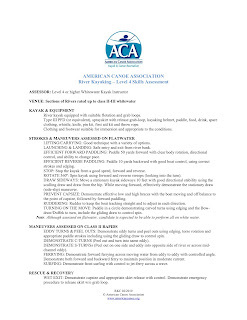 Memberships in your local paddling clubs. 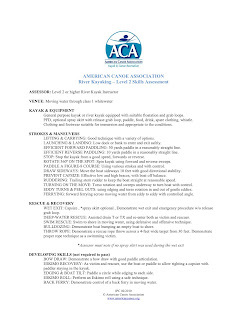 These clubs offer training and outings, and many host lively online listservs. Like public radio, they rely on people to become members to support them. 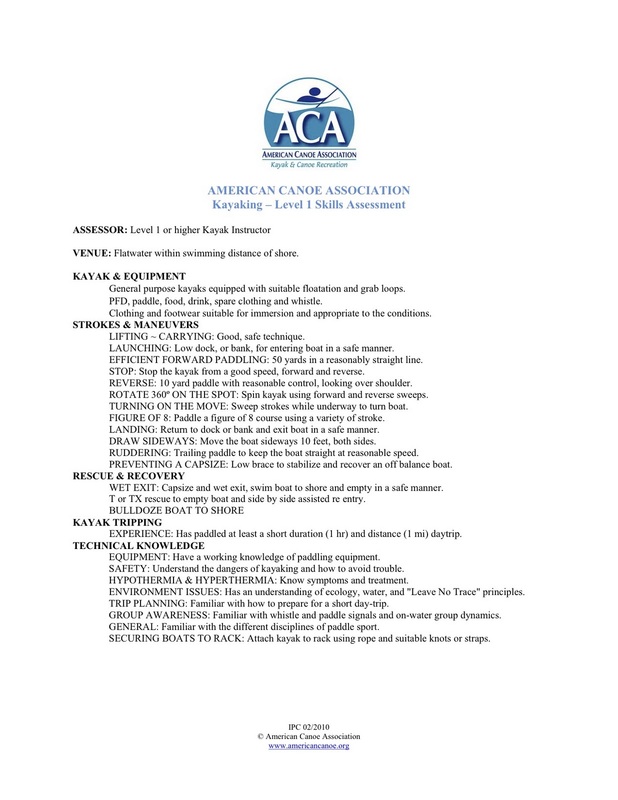 Membership is typically only $15, yet many people who benefit from the clubs don't bother to join. 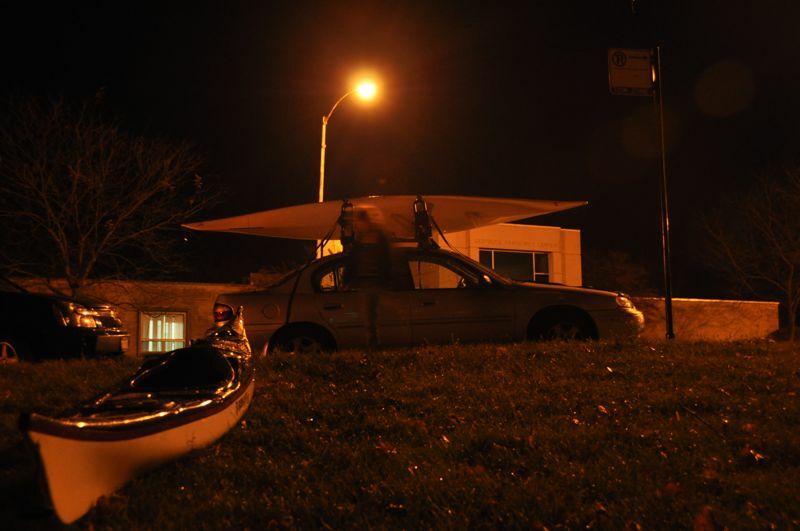 Supporting your local clubs helps them build the local paddling community and advocate for access to local waterways. 4. 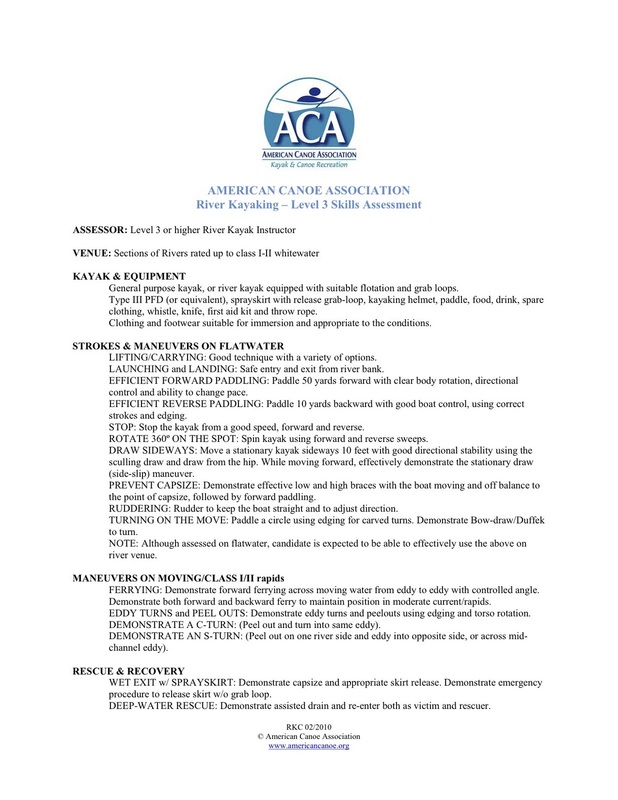 Memberships in sanctioning organizations that promote paddlesports, water safety and access, and set standards for quality instruction and assessment: the ACA, the British Canoe Association and Paddle Canada. These are the bodies that liaison with governmental bodies. 5. Donations to environmental organizations with a water-protection focus. These include local and national chapters of the Sierra Club, Greenpeace and the Natural Resources Defense Council. If there are groups working on stewardship and access in your local area, support them, too. 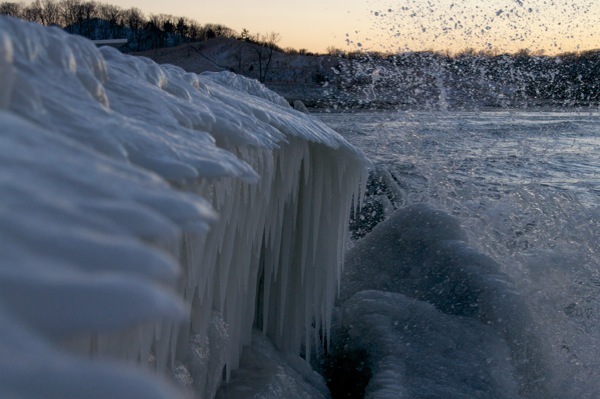 Here in the midwest, consider the Alliance for the Great Lakes. 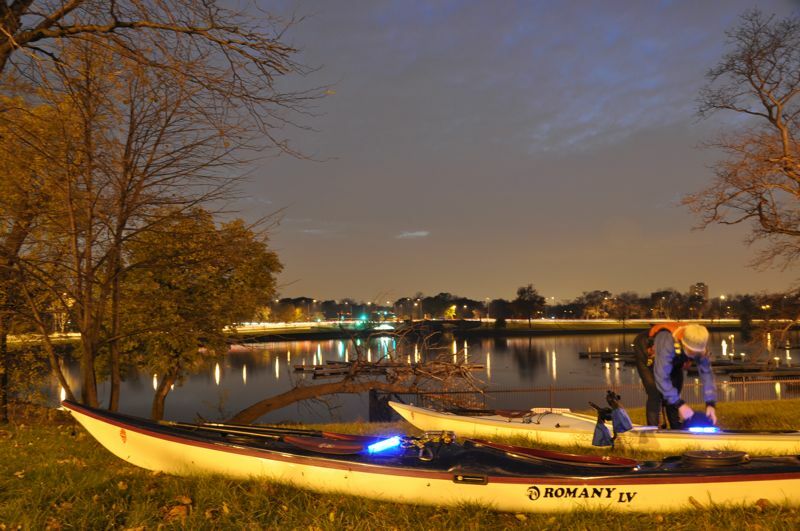 And if you're in Chicago, consider Friends of the Chicago River. 6. Registration for a summer symposium, where your paddler can learn new skills, meet other paddlers and get to know some of the top coaches in the country or the world. Early-bird discounts are available now. Suddenly, you aren't behind in your gift-giving; you're ahead of the game! 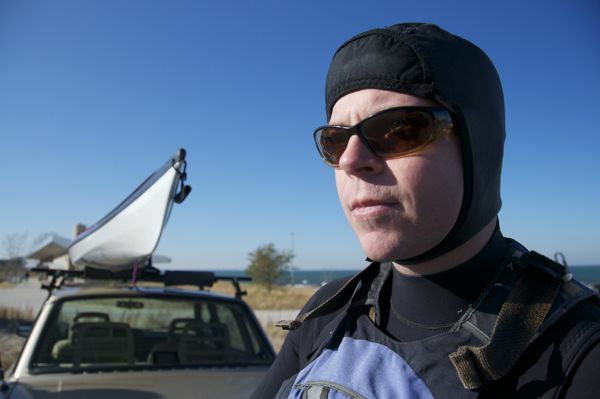 Sunday's winds kept us off the water, but they didn't keep us away from the marine forecast. We were riveted by the prospect of 22-foot waves. What would they leave behind? The marine forecast on Sunday promised some of the biggest waves we've heard about on southern Lake Michigan. The biggest waves weren't forecast to hit the shores at Chicago, but Indiana looked like it was getting pounded. 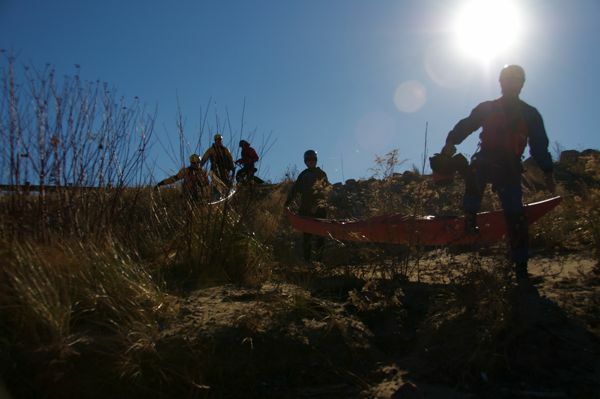 The wind continued on Monday, causing hazardous road conditions. 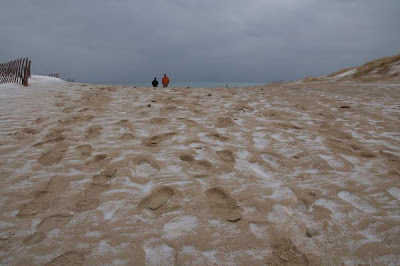 But on Tuesday, we set out to see what the waves had created at the beach near Portage, Indiana. It was like a sculpture park, with ice that looked in some places like wax and in others like glass. 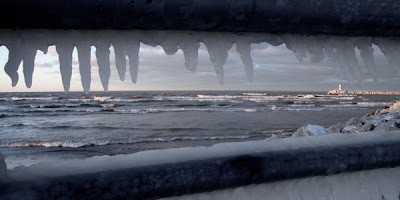 The combination of freezing spray and wind created icicles with odd twists hanging at unlikely angles from some surfaces, and draped over others. 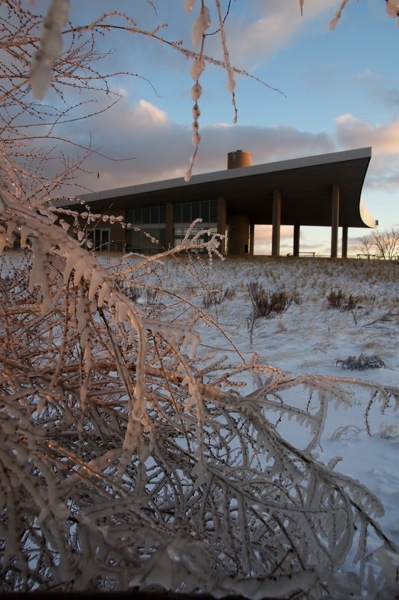 The Portage Beach building was closed for the season. 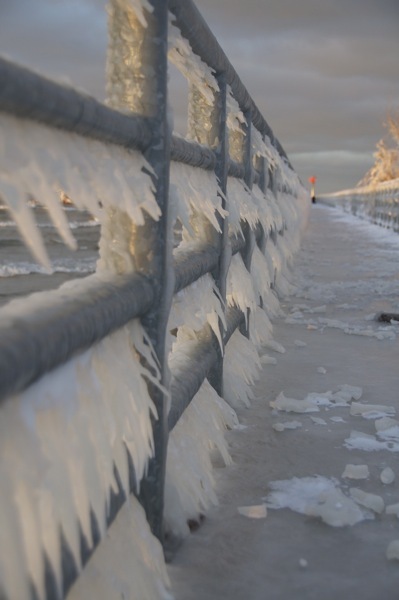 The walkway on the break wall was coated in ice. 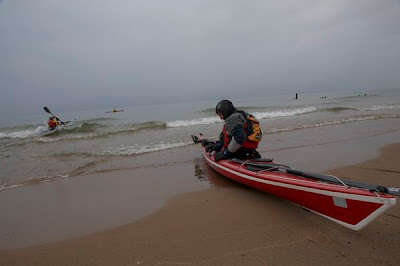 We were astonished to see two surfers paddling out to try to catch some waves. 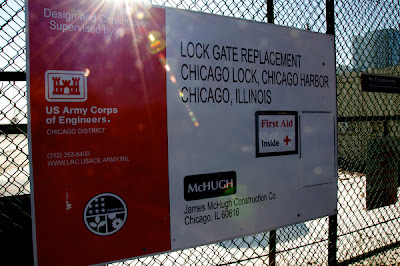 The Chicago Harbor Lock is a monumental structure. 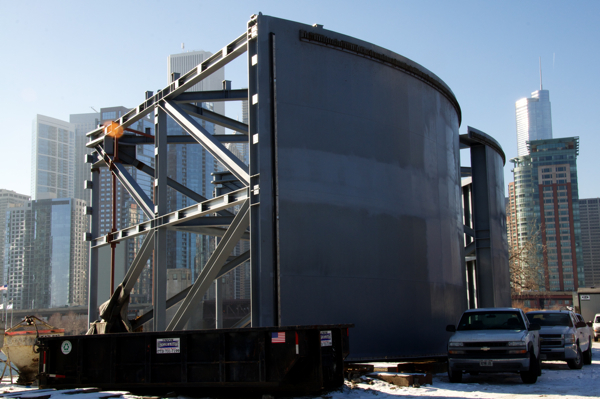 Designed and built in 1936 to 1938, it was part of the remarkable engineering feat that reverse the Chicago River so that the city's sewage would flow away from Lake Michigan, not into it. 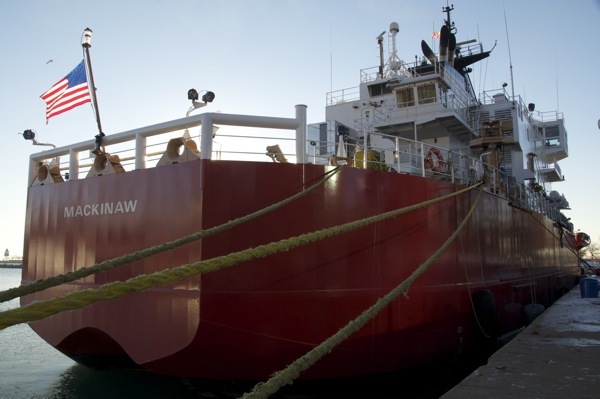 These days, the lock opens and closes for 40,000 ships per years--commercial vessels, tour boats, pleasure crafts and kayaks--according to the US Army Corps of Engineers, which operates it. Or rather, it did until it was closed on November 1 so that its aging gates and hydraulics could be replaced. McHugh was awarded the nearly $15 million contract to repair the Chicago Harbor Lock. We've paddled through the locks many times, so we couldn't resist the opportunity to check out how the job was going. Everything was on a superhuman scale. 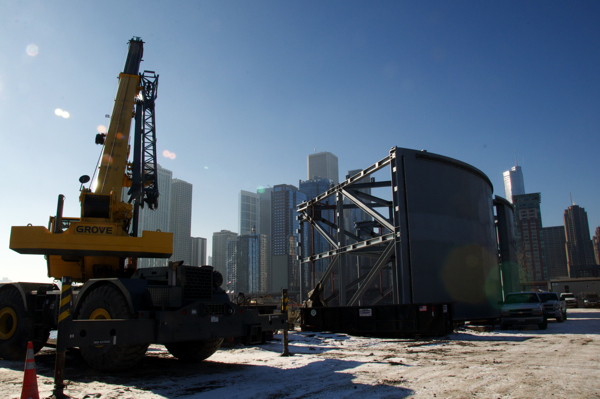 Two of the four new structural steel sector gate leafs. Still life with construction equipment and skyscrapers. The project is due to be completed by Tax Day 2011, which seems appropriate for a taxpayer-funded project. Between now and then, we'll check on its progress. You know that uncomfortable feeling when you walk into a room and you aren't really sure whom to talk to or what to say? What you need is the USCGC Mackinaw, designed to ram through 32 inches of solid ice or ten feet of brash ice, and to fully penetrate a ten-foot pressure ridge in less than half an hour. 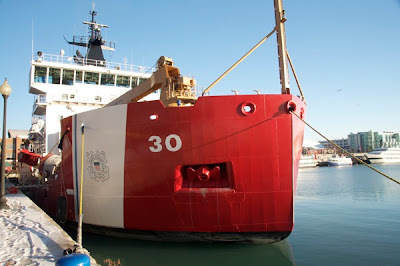 Or maybe you don't need that, but the Coast Guard does, and it's mighty proud of this five-year-old vessel, which was docked next to Chicago's Navy Pier this morning, after distributing 1,200 Christmas trees to low-income families and retrieving buoys for the winter. This is a luxury liner of a Coast Guard vessel. It boasts a 3133-square-foot heated buoy deck as well as two-person staterooms for its 55 crew members. And it has "multi-mission capabilities," meaning it can be used for search-and-rescue, buoy-tending, ice-breaking and even oil spill containment, as well as continuing the nearly 100-year-old "Christmas Ship" mission. Now there's a conversation starter! 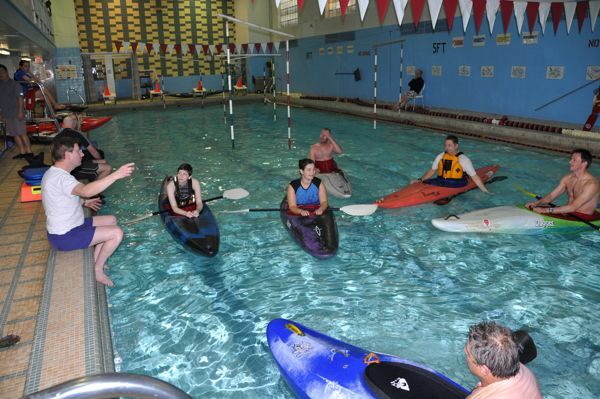 John Karch explaining whitewater basics to a pool full of students. 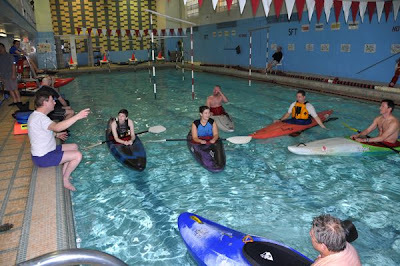 This is week nine of the first of two 10-week whitewater kayaking courses offered by the Chicago Whitewater Association in the West Cook YMCA swimming pool. 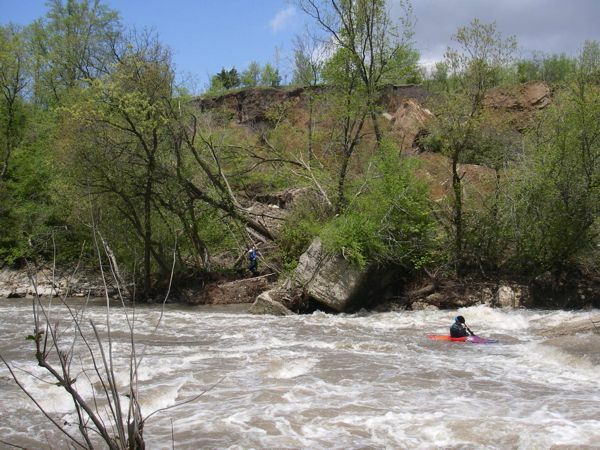 After the winter and spring sessions, the club offers a series of beginner trips on increasingly challenging local rivers. 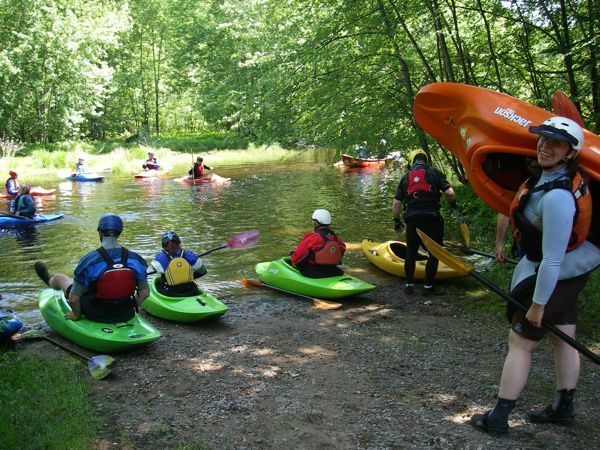 It's a wonderful way to learn to paddle. 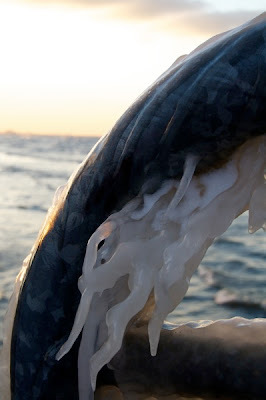 This is our spawning ground. We started learning to paddle here eight years ago. 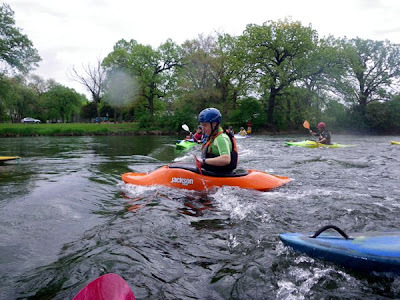 We were awestruck by the skill and generosity of our instructors, who volunteered their Sunday evenings teaching us to paddle and roll and let us borrow their boats and gear. A few months later, they were out on their first river trips. 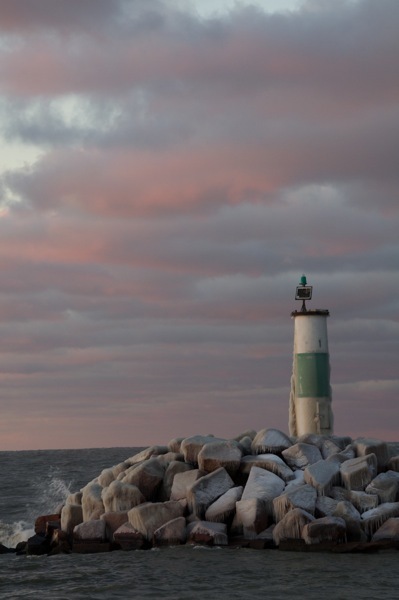 Culminating in a trip to Wisconsin's Wolf and Peshtigo Rivers. This year, we are the lead instructors at the West Cook Y. (Full disclosure: We're substituting for our our whitewater mentor, John Karch, who isn't available every Sunday this year but whom we expect to take the course back from us when he can.) It only took us nine weeks to realize that we could post our handouts on our blog, saving paper and ink and making the material more widely available. So that's what we're doing here. Below you will find handouts on hypothermia, safe river kayaking, gear checklists and more. 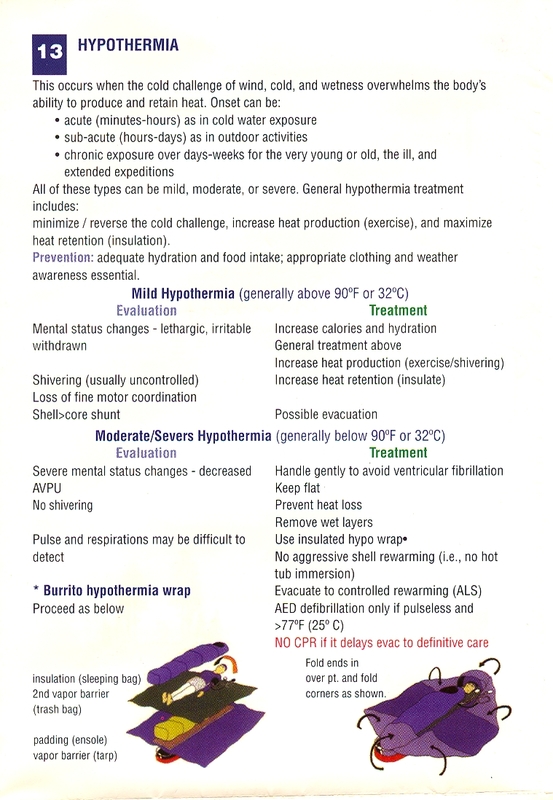 Hypothermia - from the Wilderness Medical Associates Field Guide. 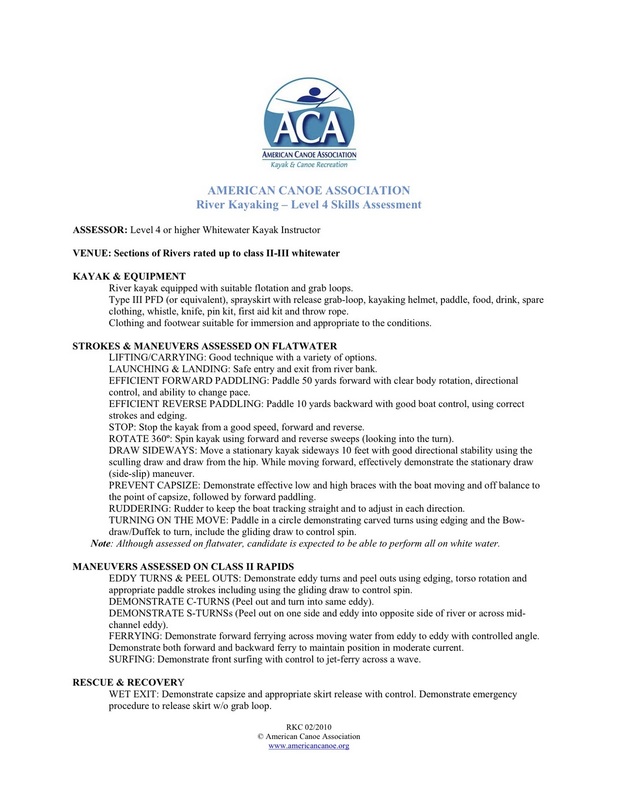 The American Canoe Association "Paddler's Checklist." The ACA's Guidelines for river paddling. 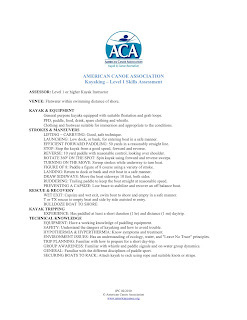 We just created a resource list for our students. We'll post it here soon. 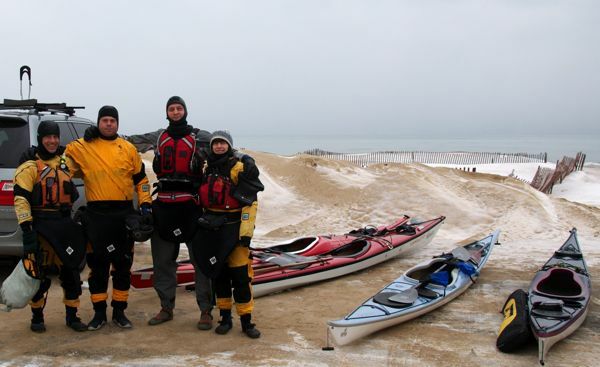 As winter settles in, opportunities to paddle on Lake Michigan gain a certain urgency. 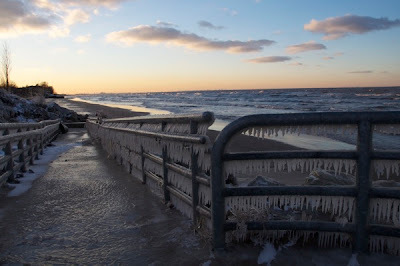 Perhaps it's because we don't know how much longer we'll have safe access to water in its liquid state; perhaps it's because once we get out of the habit of bundling up and venturing out on bitter cold days, we'll find it easier to make excuses for staying indoors. Either way, yesterday's paddle with Keith Wikle and John Flemming from Saugatuck to Holland, Michigan, and back again was winter paddling at its finest. 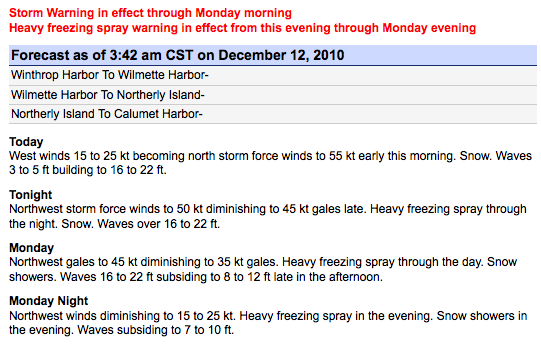 Cap'n Wikle wants you to put on your dry suit. The parking lot was nearly abandoned, except for the occasional wistful boater who considered the season over but drove by to look at the lake. 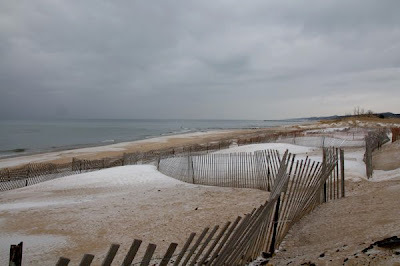 A light dusting of snow covered the sand. We loaded our boat and dressed quickly, trying to retain the heat from our cars in our fingers and toes as long as possible. Ours were the first footsteps to disturb the surface. We wore pretty much every layer we owned. Ordinarily we would have welcomed the three- to five-foot waves that were predicted, but given the sub-freezing air temperature and 40-degree water, we were fine with relatively calm water. We headed north, toward Holland. Sharon punches out through the minimal surf while John finishes attaching his spray skirt. By the time we got on the water, everybody had lost feeling in their toes and several of us had cold fingers. But paddling warmed us up. First we removed our neoprene hoods; next we felt the blood surge back into our toes. This is one of the pleasure of winter paddling: You can stay warm as long as you keep moving. 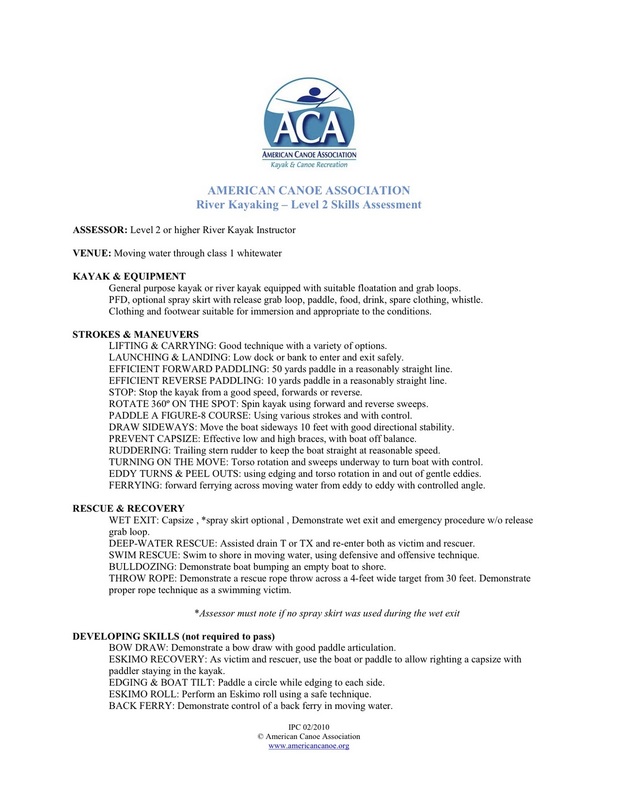 And if you have the right experience and equipment, you can be safe. 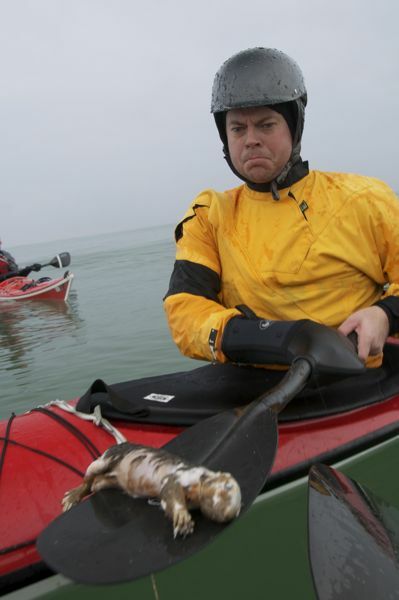 You never know who you'll meet on the water. This time, it was either a squirrel or a rat that had seen better days. 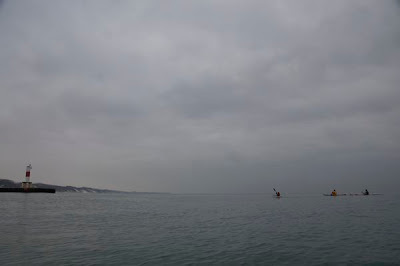 When we arrived at the Holland channel, we contacted Scott Fairty of Geneva Kayak Center and asked him to look for us on the Spyglass Hill webcam. He took a screen shot. The view from the webcam. By now, the air was cooling and the light was fading. 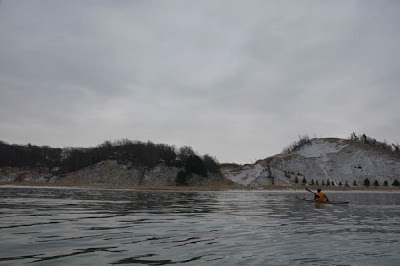 We paddled south toward Saugatuck, hoping to make it back before dark and barely succeeding. Back on the beach, just after sunset. 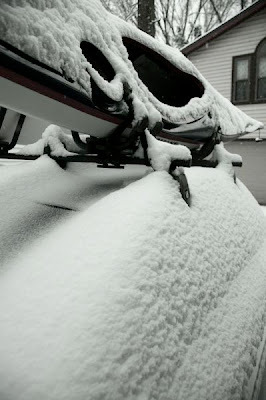 We loaded up quickly, trying to keep warm while putting away wet boats and gear. 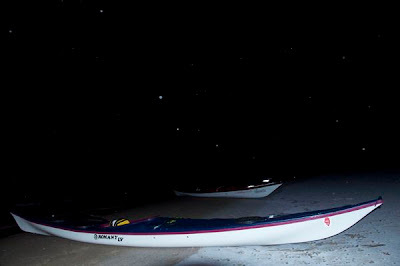 Our two-piece paddles were frozen into one-piece paddles. The quick-release knots in our short toes were ice balls. Touching anything metal was painful. 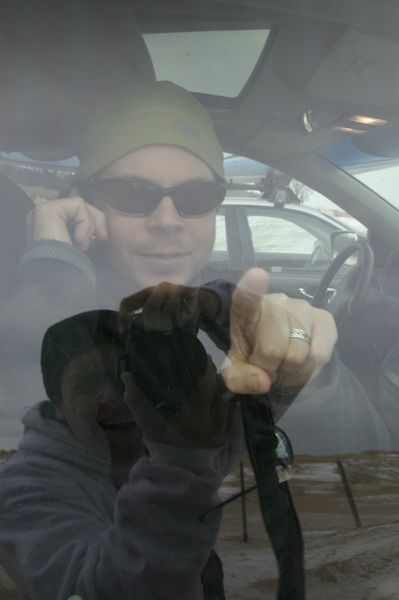 But our warm cars rewarded us for our quick work in the cold. This morning, we awoke to the snowfall that was predicted to fall yesterday. Our kayaks were blanketed in snow, dreaming, no doubt, about the previous day's journey. As winter approaches, we get more Canadian air in Chicago. 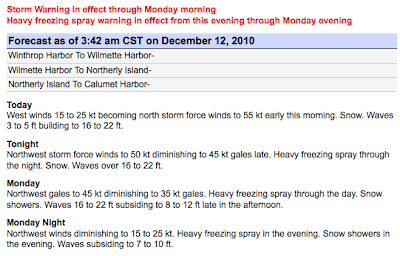 When the winds are out of the northeast, Chicago gets the big waves; when they're out of the northwest, Lower Michigan gets pounded. And in either case, some of them bend south toward Indiana. Friday's Force 7 winds subsided considerably overnight. 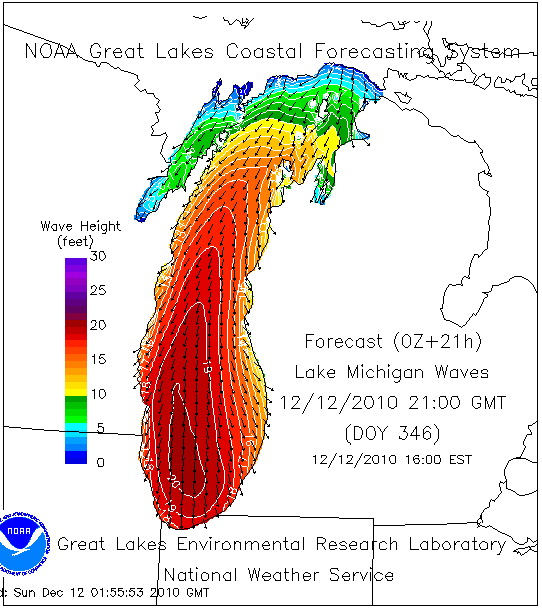 By Saturday morning, Indiana was the beneficiary of lovely, well-formed waves. Even though the air temperature was around freezing and the water temperature was in the mid-40s, the combination of sunshine and light winds made for perfect paddling conditions near Portage, a nice midway point for paddlers from Illinois and Michigan. Keith Wikle, representing Michigan, dons his neoprene, dreaming of the Santa Cruz Surf Kayak Festival. Hauling the boats down the hill. There were icicles on the railings along the pier, but as long as we kept moving, we stayed pretty warm. Warming up before heading out onto the lake. After about two hours, everybody was ready for some hot tea and dry clothes. We loaded our boats and gear, emptied our thermoses, and drove off to the east and the west, grateful for another good day on the water. Lately, a variety of things (school, work, family, events) has forced us to do most of our paddling in the late afternoons and evenings. 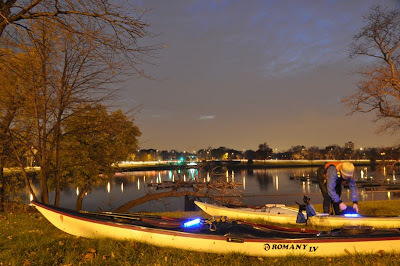 With the recent time change, that means it's hard to get on the water before dark. Last night, the sun set shortly after 4:30. By the time we finished loading our boats, it was completely dark. We were the only boats in the harbor. 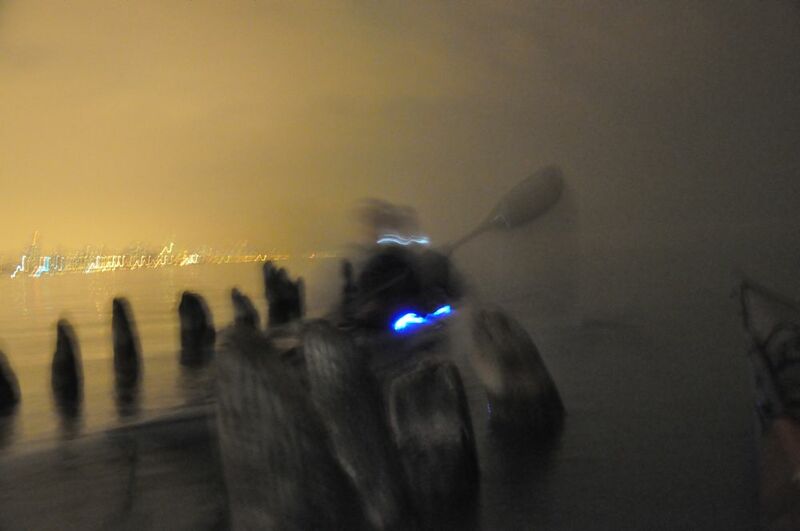 Paddling out of the harbor. We were also the only boats on the lake, aside from the freighters making their way up and down the shipping channel many miles away. Familiar as we are with this area, it felt different in the dark. It was quiet, peaceful and solitary. Paddling among the pilings half a mile off shore. It felt creepy at first and a little confusing. Our sense of distance was altered, and our sense of hearing was especially acute. But it was also absolutely lovely. Nearer to shore, the city's street lights cast an eerie glow. 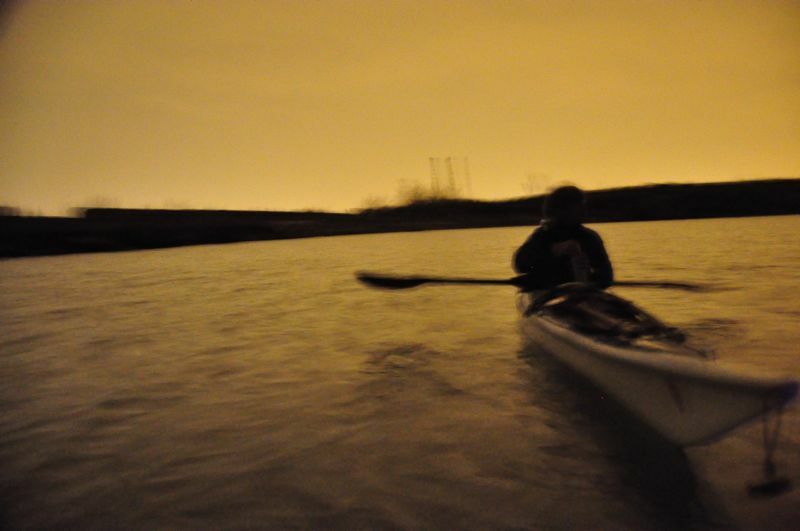 Three hours of after-work paddling felt like a mini-vacation. 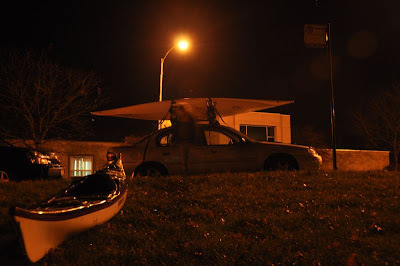 We landed, loaded up and drove away in the dark, and hung up our gear to dry by moonlight.